Melpomene & The Trinity of Mourning is a series of performance art works by Leah Clare Michaels. creating a series of mourning rituals intended to draw awareness to personal and political social justice issues. A multi-channel video and sound installation showcases a series of mourning rituals. Leah appears as surfer, priestess, and artist performing last-rite rituals for the ocean, accompanying the sea as “she” is dying. Viewers are invited to walk around the three sculptures, which are designed to reference surfboards, stained-glass windows, and cathedral portals. As the viewers move through and around the installation, they create metaphoric currents, acting as bodies of water, while bearing witness to the rituals and mourning the ocean’s impending passing. 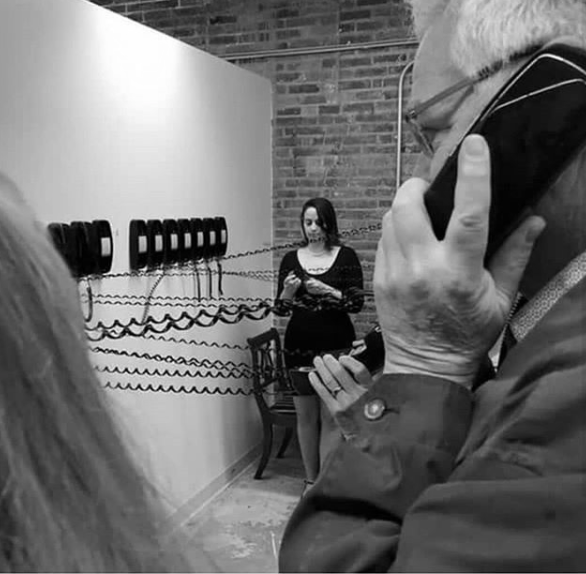 During this live performance, Leah, dressed in black, cuts the cords of 30 black telephones as a memorial to a dear friend who died tragically at age 30. This piece is performed on the anniversary of her death. In the piece Clean All the Stolpersteine, Leah, dressed in black, uses white rags to clean individual brass cobblestone memorials in Berlin and Rome that are dedicated to victims of the Holocaust. The memorials, called Stolpersteine, have been created by German artist Gunter Demnig since the early 1990s. His series acts as an ever-growing collection of intimate memorials embedded in the streets outside the houses where people lived when they were kidnapped and taken to concentration and extermination camps. Each Stolperstein (“stumbling block” in English) bears a brass plate engraved with the name and birth-death dates of the victim. To date, Demnig has placed more than 70,000 stones throughout Europe. As an American with European ancestry, including German and Italian, Leah’s act of cleaning and mourning aims to: honor the individuals who were lost to the Holocaust; honor Gunter Demnig for starting and continuing his project; draw attention to political cycles we have seen before that are occurring again; raise awareness of the role the United States has played in turning away Jewish immigrants and others seeking asylum, as well as carrying out the internment of Japanese immigrants and United States citizens of Japanese descent during World War II; and discuss the United States’ lack of memorials to the atrocities our government has enacted. The piece focuses on the role of public space, public memory, and rituals of mourning. 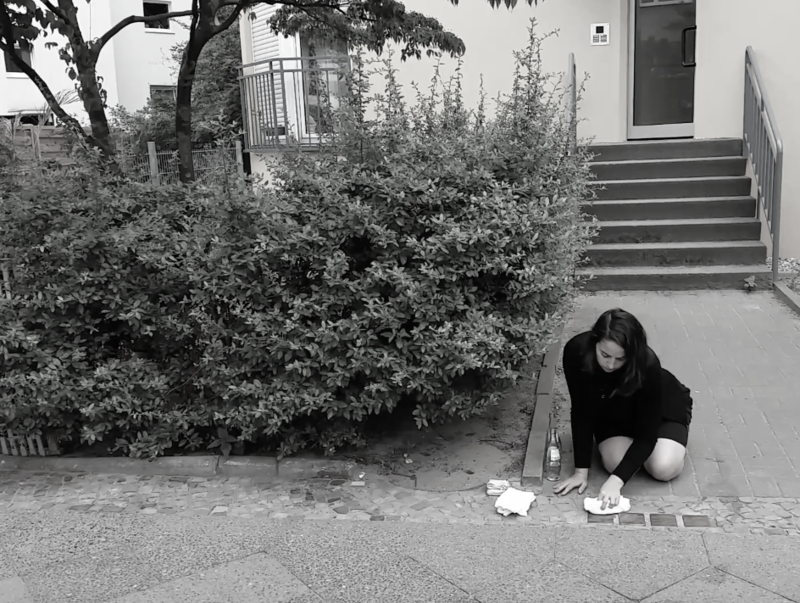 Leah plans to continue cleaning Stolpersteine wherever and whenever she stumbles upon them.